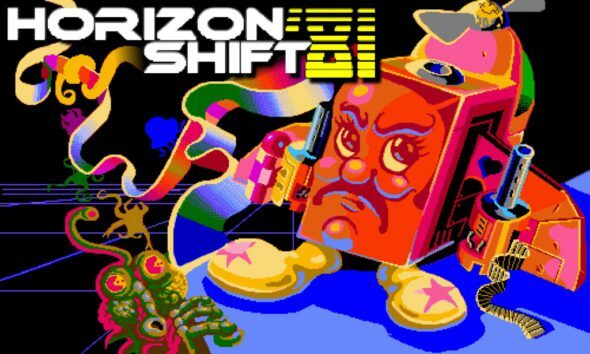 Three and a half years ago the developers at Flump Studios released the PC game Horizon shift, a retro arcade game. Now, a couple years later they brought that game back to live with Horizon Shift ‘81, a brand new game for the Nintendo Switch. 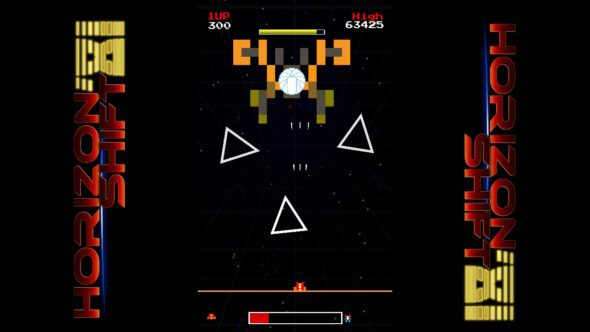 The game will take you back to the eighties and will let you have control over your own battleship as you fight your way through different phases and bosses in order to score as many points as you can. Do you have what it takes to be the best? Start reading below and find out! When you first start playing Horizon Shift ‘81, you will quickly find out that the game doesn’t have a story mode included. In the first few phases of the game, you will have to follow a tutorial but after defeating your first boss it is simply your goal to destroy the enemies and asteroids that are trying to destroy you. The fact that the game lacks a story isn’t a bad thing; the game gives a retro arcade kind of vibe and adding a story would have ruined that. Like mentioned before, the game feels like a retro arcade game. One of the biggest reasons for this is because of the graphical style. 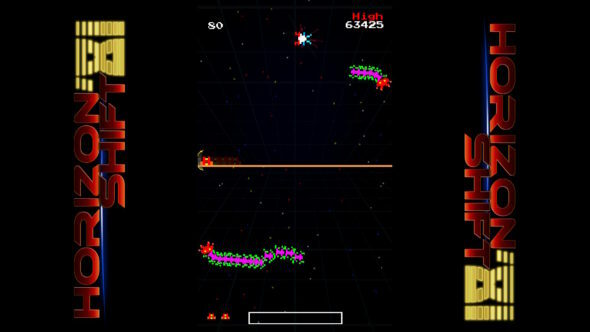 You will find yourself as a battleship standing on a line on the screen and enemies are spawning from above and from beyond. The background gives an intergalactic feeling to the whole thing and with everything designed in a retro arcade style, it just completes the feeling. The music and sound-effects that are used in the game aren’t particularly bad. The music that plays in the background during the different phases gives it a intergalactic mayhem feeling, and then of course there are the typically arcade sounds when you shoot or get hit. However, they could have really spiced things up with the addition of more sound-effects when you shoot etc. All in all, when you look at the big picture, it all fits in with the main theme of the game, so it isn’t that bad. Of course the music changes during the phases. During some phases it gives a more calming vibe and at other times you can really tell chaos is about to start. When you encounter a boss, the in-game music changes to a heavier tone and just by listening to the sound you can tell that a boss is about to appear. 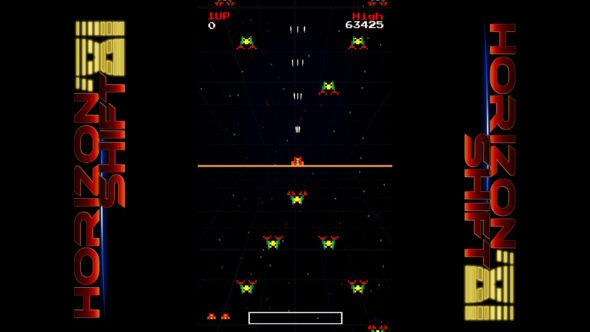 Horizon Shift ‘81 is an arcade game. In the game it is your goal to score as many points as you can by completing different phases. To complete a phase, you will have to defend yourself from incoming asteroids and enemies. When you start playing the game you will find yourself on top of a line on the horizon (middle) of the screen. With enemies and asteroids spawning from above and beyond this line, it is your goal to destroy every single one of them until the phase is complete. During the game you will quickly find out that there are some different kind of weapons that will drop. A random card will show up with a text of what it contains and then it is your goal to pick it up when it is about to reach the line that you are defending. Some of the weapons you will find are a shotgun, SMG, flamethrower, blazer and a few more. What kind of weapon you want to use during the phases is really up to your preferences as they all have their pros and cons. You can only have one weapon at a time, when you decide to pick a new one up the previous one will dissapear. 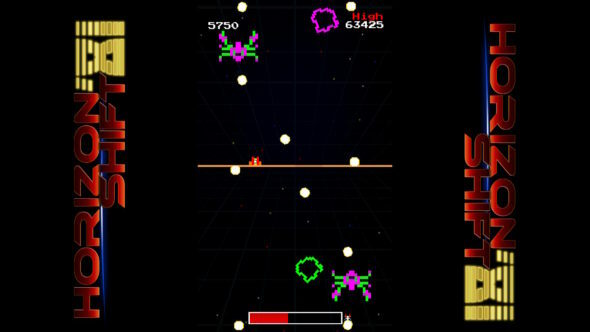 Like mentioned before, during the game you will have to defeat the enemies and asteroids that are coming in. However, if they manage to reach the line that you are on, two different things can happen. Either the enemies will stay on the line and start moving sideways in order to kill you. When it is impossible to shoot them when they are on the line you can still dodge to the sides and slide right through them while killing them instantly. However, when an asteroid reaches the line it will slam a hole in it, which prevents you from using the whole line, limiting your space. When you start playing the game, there are a couple of game modes you can choose from. The first one is ‘Arcade Classic’. During this mode you will have to defend yourself just like we explained before. You will have three lives before it is game over and there are checkpoints after you have defeated a boss. These checkpoints will spawn after every 5 phases. The second mode is called ‘Arcade Arrange’. It is exactly the same as ‘Arcade Classic’, but you only have one life so it is harder to play and you will have to be more cautious. Then, we have the ‘Speed Up’ mode. Here the enemies and asteroids will come in faster after every phase you complete. There is nothing different, you will still have three lives to defend yourself and it is still your goal to score as many points as possible. The last mode is the ‘Hyper Mode’. Here, the game speed will be at 150% all the time and you only have one life to defend yourself. When you look at all the different game modes that are available, you will find out that they all are a bit similar. However, by adding the speed or the one live options the game really challenges you to try your best and score as many points as possible. Horizon Shift ‘81 is a nice game to play. The game gives the feeling that you are playing a retro arcade game but with a next-generation vibe to it. The graphics and sound really contribute to this and are a nice addition to the game. The fact that there are different game modes make the game feel challenging and non-repetitive. So in the end we can say that the developer did a good job with this game.